With approximately 20 miles of creeks running through urban areas, it is no wonder that a considerable amount of litter accumulates in our waterways. Additional litter is brought into our estuary by the tide and deposited in the salt marshes. Litter is not only unsightly, but also covers vegetation and can trap or poison wildlife. Friends of Corte Madera Creek’s first creek cleanup was held in 1996 in the tidal section of Corte Madera Creek, and with the help of Trout Unlimited, Marin Recycling, and Marin Outdoors, we picked up hundreds of tennis balls, mountains of Styrofoam, old tires and other trash, a hypodermic needle, rat poison and a bottle with a message (the content of which history does not relate). 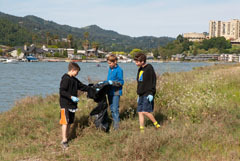 Friends continues to organize an annual cleanup of the tidal marshes of the Corte Madera Creek as our contribution to the state-wide, and now International, Coastal Cleanup Day each September. Over the last several years the haul of trash and recyclables has been between one-half a ton to one ton each year. The City of Larkspur and the Town of Corte Madera help by picking up and disposing of the trash, and the Golden Gate Bridge, Highway and Transportation District allows us to use the ferry terminal parking lot for staging our cleanup and provides a dumpster to dispose of the collected trash. Since the flood of 1982 municipalities upstream have organized annual cleanups that take place before the winter rains, to remove trash, and the woody debris and low-hanging branches that are considered impediments to flood water. The benefits of leaving natural debris and low-hanging branches are often overlooked: low branches reduce water velocity and so limit bank erosion, while fallen trees are an essential part of a good fish habitat. To participate in Friends’ late summer cleanup, watch for information in the calendar section of our website or in Creek Chronicles. For information on fall creek cleanups in Fairfax and San Anselmo call each town’s volunteer coordinator; for information regarding Ross, contact the Department of Public Works.